In order to follow this guide you will need to download Mobogenie. Please click the green button below. First of all, we will need to run the downloaded file to install Mobogenie. We can choose a folder where we want Mobogenie to be installed. After that, by clicking on Continue we will see a percentage counter for installation. When it is finished, we will have to follow some steps to configure it correctly. Now we need to connect the Smartphone to our computer with a cable. 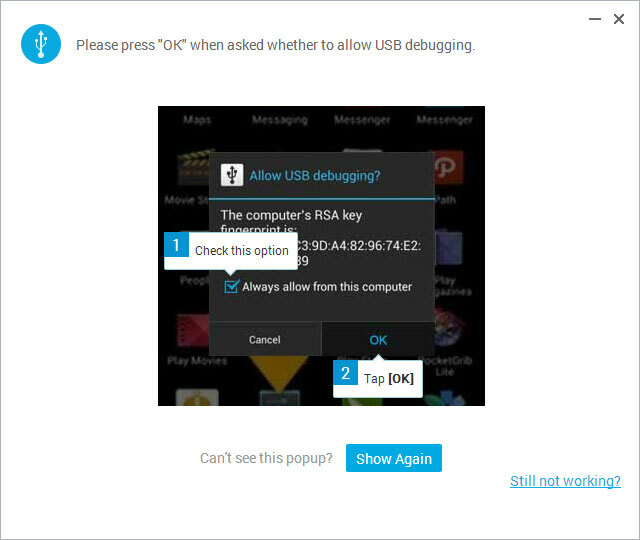 When we see the screen that appears in the next image, we need to take the smartphone and follow some simple steps to activate USB debugging. Now, on our Smartphone, still connected by the cable, we will go to Settings and there, in the end of the list, we choose “Developer options” and make sure that “USB debugging” is active. Soon after that we will see a green pop-up screen which says that Mobogenie is trying to access our phone. We need to accept it. This process is shown in the next image. When synchronizing is finished we will be able to enjoy the application from both the smartphone and the computer.